It’s worse than you can imagine. An idiot surrounded by clowns. Trump won’t read anything—not one-page memos, not the brief policy papers; nothing. He gets up halfway through meetings with world leaders because he is bored. And his staff is no better. Kushner is an entitled baby who knows nothing. Bannon is an arrogant prick who thinks he’s smarter than he is. Trump is less a person than a collection of terrible traits. No one will survive the first year but his family. I hate the work, but feel I need to stay because I’m the only person there with a clue what he’s doing. The reason so few jobs have been filled is that they only accept people who pass ridiculous purity tests, even for midlevel policy-making jobs where the people will never see the light of day. I am in a constant state of shock and horror. — Wolff, Michael. Fire and Fury: Inside the Trump White House (p. 186). Henry Holt and Co.. Kindle Edition. 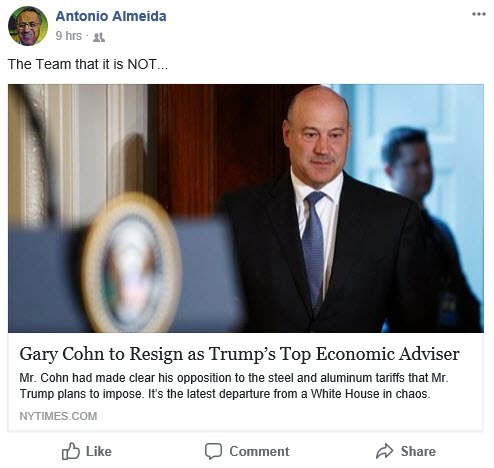 Gary Cohn himself, the only person there with a clue of what he is doing, is now leaving. Who will turn the lights out when it all ends?